As you can roughly see, the 4-pin 12V connector on the motherboard is now obstructing the screw/bolt on the back of the card, and the card will not slot in! Yes, great design on Asus's part by putting the 12V connector in such a stupid place. In the end I had to sacrifice my Audigy sound card in the top PCI slot and put the 7900GT in the bottom PCI-E x16 slot. It is also now pretty much touching the PCI card in the bottom slot and causing bad heat build up there. Of course I don't have much choice - the stock fan is loud enough to be heard upstairs! 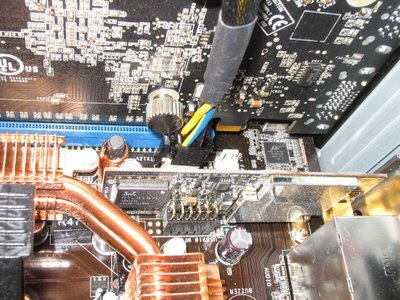 In summary, if you have the Asus M2N32-SLI Deluxe motherboard, and a 7900GT, don't even think about putting the VF900 on it! Hell, it's even a good enough reason to avoid the M2N32-SLI Deluxe board for me! On-board audio - does it ever work? Mmmm... Toasted 7900GT for breakfast please!